Ready to meet your NBC World of Dance celebrity judges? Say hello to Jennifer Lopez. How she got her start: You know Jennifer Lopez as many things—singer, actress—but it was dance that got her into showbiz. “I ate one slice of pizza each day — no breakfast, no lunch. I would eat it at 6 p.m. so it would hold me over until the next day. That’s how I lived, once I moved out of my mom’s house, and I did that for a couple of years before I got my first big job, and I wouldn’t change it for the world,” Lopez said at a recent World of Dance press event. That first big job was In Living Color, where she rocked it as a Fly Girl, beating out 2,000 other applicants. She was also a backup dancer for New Kids on the Block at the American Music Awards in 1991 and was schedule to tour with Janet Jackson in 1993 but ultimately backed out. Lopez always had her eye on acting, and soon found her way into film. But it was her breakout performance in Selena, which showcased plenty of her dancing skills, that made her a star. She continued to make it big in Hollywood, but in 1999 she transitioned to music with her first single If You Had My Love. It was her music career that brought her back to her dance roots with some of the slickest dance videos of the 2000s. Now, in 2017, after a stint as a judge on American Idol, Jennifer Lopez has come back to her dancing roots. As an executive producer and judge on NBC’s World of Dance, she is helping other dancers achieve their dreams by competing for a $1 million cash prize. 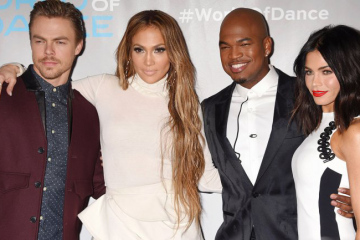 To see more of Jennifer Lopez, tune into NBC’s World of Dance May 30th at 10/9 central to see the world’s best dancers battle it out for a whopping $1 million prize.